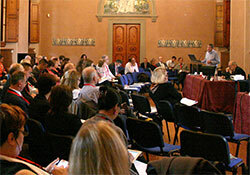 Hosted by the Region of Tuscany, the 2014 annual meeting of the Regions for Health Network took place on 20-22 October in Florence, Italy. Members of the Regions for Health Network (RHN), representing 25 regions from 20 countries across the WHO European Region, met in Florence, Italy on 20–22 October 2014 to discuss cross-cutting public health issues from a subnational perspective. The first part of the annual meeting included presentations and discussion on intersectoral action, the co-production of health, investment in health from childhood through the life-course, management of policy change and the role of advocacy and communication. “Hosting the meeting was a big effort, but important for us. It has given us and our minister an opportunity to reflect within the Tuscany Region on how to broaden the scope of health beyond fighting diseases, and debate the Health 2020 values. It is also a pleasure to see Florence through the eyes of others, in an environment so conducive to creating health, networks and friendships,” said Alberto Zanobini, Head, Office of Research, Innovation and Human Resources, Department of Health, Tuscany Region. Presenting a politician’s perspective, Vaughan Gething, Deputy Minister for Health in Wales, United Kingdom, explained how “health is the universal service”, and an entry point to address inequalities by reaching those most in need. He outlined the Welsh Government’s focus on prudent health care: a patient-centred approach that ensures patients receive the most appropriate agreed treatments and promotes individuals’ contribution to their own health and well-being. He recognized the challenges in achieving this: maintaining trust in the health service, empowering the public and changing behaviour, which requires an open, accessible system. Sir Harry Burns, Professor of Global Public Health at the University of Strathclyde, Scotland, United Kingdom, provided compelling evidence on the need to address the multiple social determinants affecting health. The leading causes of premature death in Scotland – drugs, alcohol, suicide and violence – are socially determined. Governments must prioritize creating well-being and a sense of purpose, and developing the capacity of communities and individuals disadvantaged by inequalities. Large, measurable health improvements can be achieved through small, incremental, participatory cycles of change created by health workers, such as introducing the compulsory use of a surgical checklist before every surgery. Professor Burns argued that policy-makers and administrators should not wait for research and evidence supporting an intervention before introducing small changes. In 2011, local authorities in northern Italy started work to make Bibione, a beach in the Veneto Region, smoke-free. Pasqualino Codognotto, Mayor of San Michele al Tagliamento, explained the process of involving different stakeholders: meeting with representatives of the local tourist industry, police force and holidaymakers. Evidence on the high concentrations of tobacco smoke on the beach and the environmental impact of discarded cigarette butts, and from a questionnaire for beach users, were key factors that convinced the local authorities and tourist industry to act. The Tuscany Region changed its approach to health communication in schools. Following a survey of Tuscan schools in 2009/2010, collaboration between the health and education sectors to address young people’s health moved away from a focus on health risk factors – smoking, drugs and risky sexual behaviour – to emphasize promoting health and enabling young people to acquire the life skills to choose healthy behaviour. Going beyond conventional communications techniques, which gave passive roles to children and young people, led to active engagement and peer education in health and well-being issues. On the final day of the meeting, discussions focused on further developing RHN and ensuring that it takes account of the values and direction of the European policy framework, Health 2020, and remains relevant to its members. There was broad consensus that RHN should be not only a forum for exchanging ideas but also a way to create and implement initiatives and policies. A new steering group was formed, representing members from across RHN’s geographical spread, to develop a work plan including terms of reference. “[RHN] is useful because it means I can interact with other members to get practical guidelines. For example, I asked what we need to do to scale up an initiative, and involve other sectors. I now have practical steps that I can implement back home,” said Brigitte Van der Zanden, Meuse-Rhine Euroregion. A continuous theme of the meeting was the direct and indirect roles of communication in policy-making and engaging citizens in managing their own health. Several initiatives have been established to facilitate communication within RHN, including a community website, newsletter, regular email updates and a Twitter account. This was the first annual meeting with live tweeting, encouraging the Twitter community to discuss the topics addressed during the event, using the hashtag #RHN2014. RHN welcomes new members; enquiries can be sent by email (eurorhn@who.int).